For all local news and events. 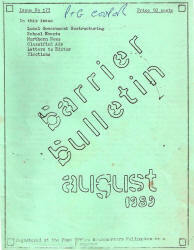 The original copies of the Barrier Bulletin were produced on a Gestetner machine. Early versions of the Gestetner were hand-cranked and later machines were electric. A stencil was prepared by removing the ribbon from a typewriter allowing the letters to strike the stencil directly and cut the letters. 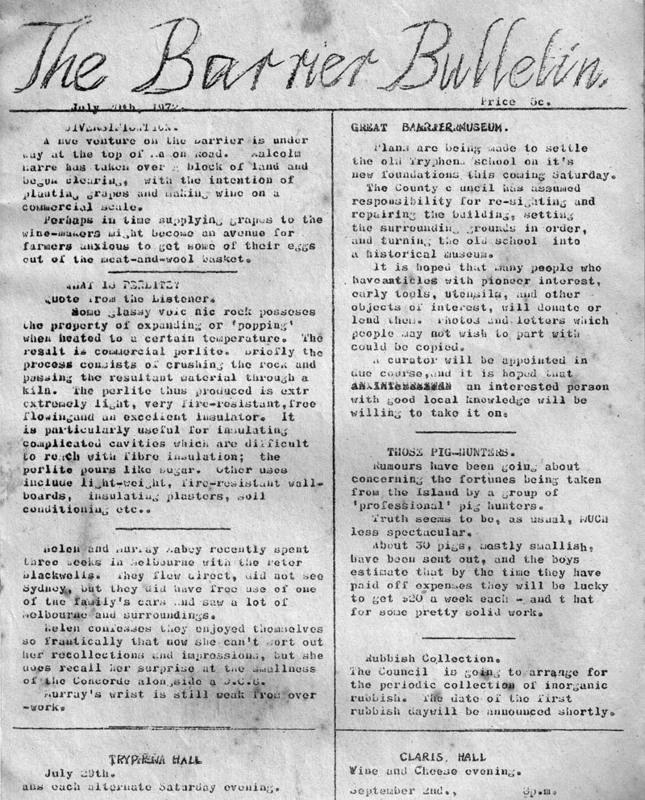 Mistakes were corrected by brushing them with correction fluid and retyping when this had dried. When cut the stencil was wrapped around an ink-filled drum, a blank sheet of paper was drawn between the rotating drum and a pressure roller and the ink was forced through the holes on the stencil onto the paper. Extract: FOR TENDER. A Hayter 4 stroke motor mower. Phone Secretary, Okiwi School Committee, 3 M, Port Fitzroy. Tenders close April 30th. 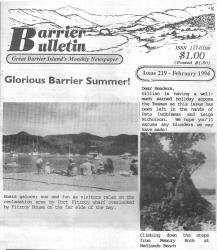 The Barrier Bulletin is edited, printed and published by Mrs. Phyll Graham at Olaris, Great Barrier Island. Many thanks to those who sent a bit extra when renewing subsctiptions. Plans are being made to settle the old Tryphena School on its new foundations this coming Saturday. The County Council as assumed responsibility for re-siting and repairing the building, setting the surrounding grounds in order and turning the old school into a historical museum. It is hoped that many people who have antics with pioneer interest, early tools, utensils and other objects of interest will donate or lend them. Photos and letters which people may not wish to part with could be copied. A caretaker will be appointed in due course and it is hoped that an interested person with good local knowledge will be willing take it on. 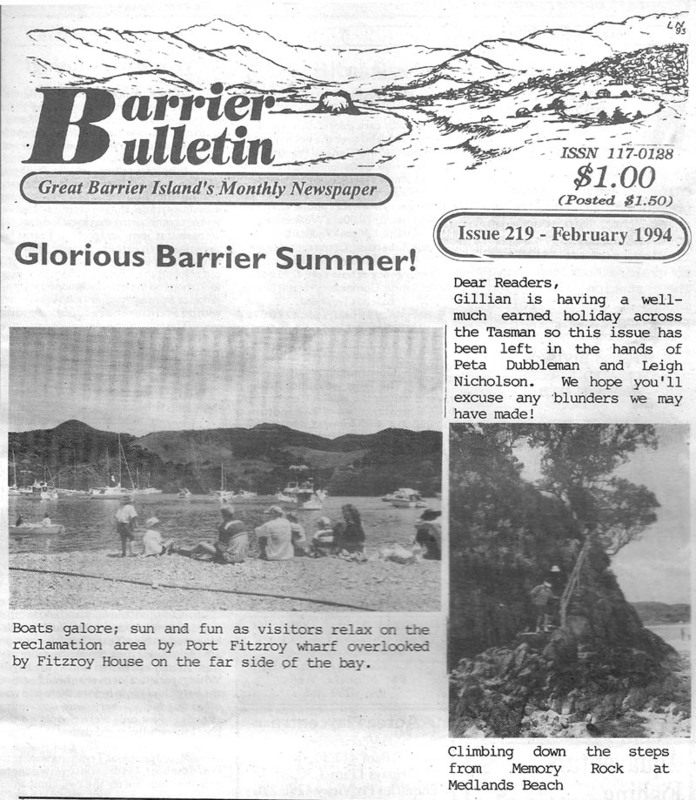 Great Barrier Island County will go out of existence on 31 October 1989. 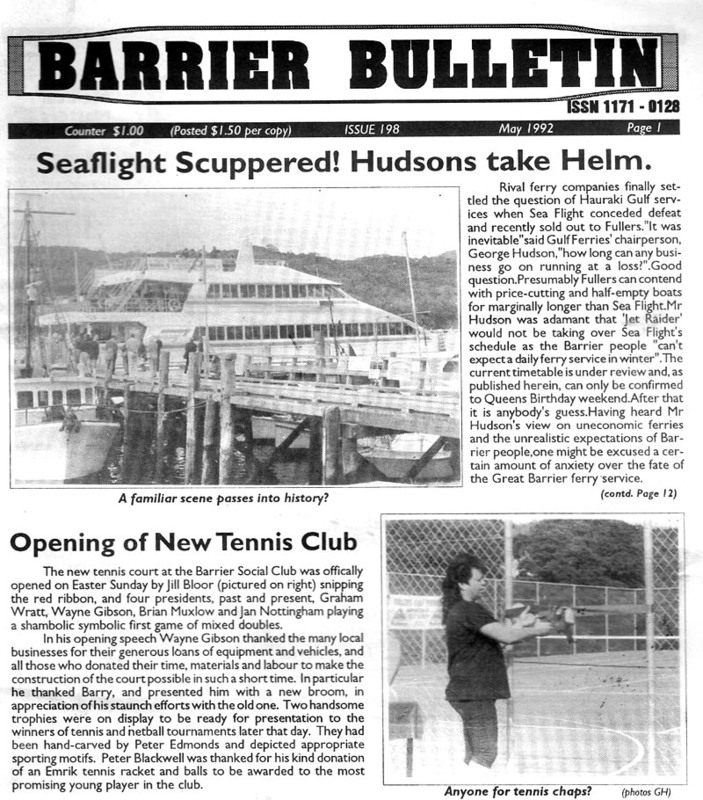 As from November 1989, Great Barrier, and also Kaikoura and the other off-shore islands, and Little Barrier, will become a part of the new Auckland City, and also a part of the new Auckland Region. Auckland City Wards. The new city will be divided into 10 wards and the Auckland City Council will consist of 3 Mayors and 24 members. Each of the wards will elect ward members, the number depending on population. The Hauraki Gulf Islands Ward will have 1 member. The area of each of the wards except the Hauraki Gulf Islands ward shall be constituted a 'community' and each community will elect a community board. 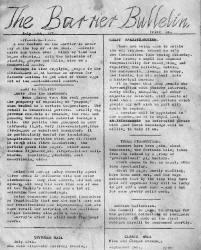 A ward member shall also be a member of the community board. 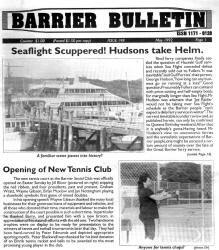 In the case of the Hauraki Gulf Islands ward, there shall be two community boards, namely Waiheke and Great Barrier. The community board will be made up of 6 members elected by the electors of the community, plus the ward member. Although the visit was initiated by Hon. Rob Storey himself, he accepted the suggestion of the Community Board Chairperson that he land at Port FitzRoy, enabling him to travel the length of the island in order to experience the distances between settlements, the narrowness and steepness of the road and the nature of the road surface, as well as the volume of traffic, which between Port FitzRoy and Claris that day amounted to three cars and a bus. The doubtful cost benefit of implementing a full warrant of fitness programme, given the low traffic volume and accident rate, was not lost on the Minister, who observed that the road acted as a means of controlling speed in most instances, so that a 120km standard was not necessary. Mr Storey appeared to be at home with Barrier conditions and to appreciate the problems. But neither he, nor Norman Dewhurst, Auckland Chief Automotive Surveyor, envisaged much in the way of difficulties or expense in utilising existing facilities for testing vehicles to a standard appropriate to the Barrier. Mr Dewhurst referred to the possibility of some type of certificate of roadworthiness and the Minister discussed an appropriate speed limit for the island. n the course of a frank and relaxed discussion with the Board, the Minister received the Board's submission asking for a one-year phase-in period for both Warrants of Fitness and Certificates of Fitness, should they be introduced. At around 12.30 pm on the 2nd January an oily streak was noticed in the waters around Port Fitzroy wharf. Subsequent investigation showed it to have come from one of the diesel tanks located under the wharf. Mobil Oil in Wellington were contacted and within three and a half hours the offending tank was pumped dry. This tank was one of three some twenty four years old and had become the victim of saltwater corrosion. The other two tanks were originally supplied by Atlantic Oil who are now under the umbrella of Mobil. On Wednesday 12th January, the leaking tank was removed under the supervision of professionals from Mobil oil. Mobil is yet to decide upon the fate of the remaining two under the wharf. Also at this time Mobil decided to remove the last remnants of the diesel and pump service from outside Port FitzRoy Store. This service ceased around 1977/78 with the removal of the pumps but the tanks were left behind. The service originated with a hand pump system around 1958 operated by Wick Newman, the then owner of Port Fitzroy Store.